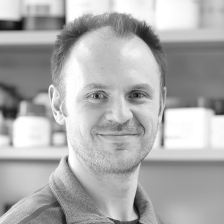 We develop next generation tools to automate and miniaturize biology and chemistry. 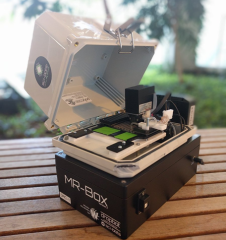 Our portable and easy-to-use DropBot platform uses digital microfluidics to transform lab experiments into software instructions that can be optimized, shared to the cloud, and replicated anywhere in the world with perfect fidelity. For more information, check out our user guide or contact us for a quote. 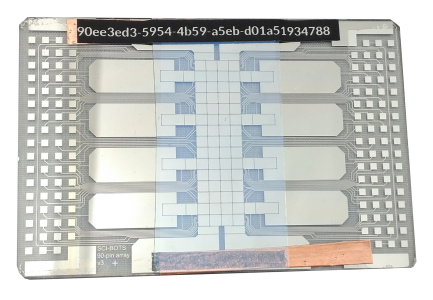 We sell general-purpose chips suitable for a wide range of applications, or contact us about making custom chips to meet specific requirements. 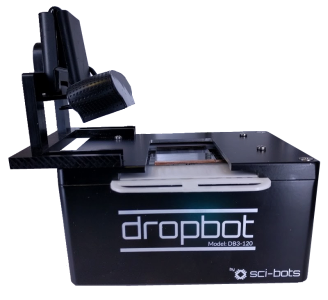 Our DropBot system is programmed and controlled over USB using a graphical user interface called MicroDrop. This easy-to-use software lets users click and drag droplets on-screen using a real-time video overlay. We have extensive experience integrating sensors and actuators with digital microfluidic-based fluid handling. Contact us us to discuss your application or to inquire about OEM sales and incorporating digital microfluidics into your products. To ask for more information, request a quote, or inquire about custom services, please contact our team by e-mailing info@sci-bots.com. Want to keep up to date with the latest updates on DropBot and our MicroDrop software?